The Bible is still by far the world's all-time best seller. It has been translated into more than 1400 different languages. Yet the Bible has been called "THE BOOK THAT NOBODY KNOWS." There is a very basic reason why! "Some months ago, a Protestant pastor administered a Bible quiz to members of his congregation. The questions were very simple. Anyone with a general knowledge of the Bible should have been able to answer all of them easily. "The results staggered the pastor. "Only five percent of his flock made a commendable grade on the test. Fifteen percent failed to give a single correct answer. Sixty percent were unable to name the four Gospels. Seventy-five percent could not identify Calvary (Golgotha) as the place where Jesus was crucified. "Some congregations might do better than that," continued our reporter, "but not many. The vast majority of Americans today are Bible illiterates. They simply have never read the book which they profess to regard as the 'Word of God.'" This same newspaper reporter continued to explain why most professing Christians do not read or study the Bible. "A great many people have turned away from the Bible because, when they do try to read it, they find they cannot understand it.... To the modern reader, it has a remote and antiquarian flavor. It is likely to leave him with the impression the Bible is an ancient history book that has no real relevance to his life here and now" (by Louis Cassels, UPI Special Correspondent on religious affairs). Have you had this impression? Have you ever tried to read the Bible, only to throw up your hands and exclaim, "I can't understand it"? Paradoxically, this Biblical ignorance is considered "respectable" today. "It is one of the curious phenomena of modern times," reports J. B. Phillips in The Young Church in Action, "that it is considered perfectly respectable to be abysmally ignorant of the Christian faith. Men and women who would be deeply ashamed of having their ignorance exposed in matters of poetry, music, or painting, for example, are not in the least perturbed to be found ignorant of the New Testament" (page 6). And so the Bible has become little more than an obsolete "sacred book" to which most of its devotees pay lip service, but which they practically never read, study, or understand! What are the underlying reasons for such widespread Biblical ignorance and lack of understanding in the world today? Why aren't people ashamed of not knowing what's contained in their Bibles? You might expect atheists and agnostics to deny the divine origin of the Bible. But would you expect that many of today's leading ministers and theologians are foremost among the CRITICS of the Bible? Incredible? One such minister of a very large church denomination said: "No mainstream Christian Church accepts the Bible as the literal interpretation of the Word of God. Some of it is folklore, some legend, some tribal history." How does he know? Answer: He doesn't! He has merely accepted as true the theories and hypotheses taught today in the seminaries and graduate schools of theology! No wonder the ordinary layman has backed away from the Bible! Listen to these words from another well-known minister: "We know now that every idea in the Bible started from primitive and child-like origins...." He said it is an "impossible attempt to harmonize the Bible with itself, to make it speak with unanimous voice, to resolve its conflicts and contradictions...."
This man was looked up to as a minister of God. Yet he attempted to discredit the very Book he was supposed to uphold and teach. Branding the Bible as the contradictory product of the vain efforts of men, he called it a book of fables and myths, instead of the INSPIRED TRUTH OF GOD ALMIGHTY! In the introduction to a well-known modern version of the Bible, the translator summarizes his ideas in the claim that many books of the Bible are "notes by disciples, worked up into literary papers which have been repeatedly edited, sometimes by pious collectors." This very learned scholar thought that the earlier portions of the Bible stemmed from "the natural desire to gather up the primitive traditions of the people." He took for granted, and without proof, the false assumption that God had nothing to do with its inspiration! Still another theologian summed up the modern trend this way: "We must take the Bible seriously; but not literally." With statements such as these ringing in their ears, is there any wonder that hundreds of ministers publicly confess — and thousands privately admit — that they themselves can't understand or believe the Bible? Certainly statements such as these by well-known ministers, theologians and Bible scholars have DIRECTLY DISCOURAGED many from trying to read the Bible! What else could you expect the average person to think about the Bible when men looked up to as Biblical "specialists" and "experts" declare it to be a PIOUS FRAUD? Most people — including church laymen and the clergy — have not taken the time to really look into the Bible and study it for themselves! They simply have NEVER PROVED what they have come to believe as the "truth." And so most people continue to carelessly assume the Bible teaches hundreds of conflicting ideas — that it is irrational and irrelevant in our "advanced" age — and that the Bible is responsible for the hundreds of differing sects and denominations we find in the world today! There is a statement in the Bible which says: "All Scripture is inspired by God and is profitable for teaching..." (II Tim. 3:16, R.S.V.). The Bible is GOD'S revelation to man of basic knowledge — laws and principles which man is unable to discover for himself — knowledge which is otherwise utterly inaccessible to the mind of man. For example: God did not directly reveal the law of gravity in the Bible. He equipped man with the powers and abilities to discover gravity for himself. But man has never been able to discover what he is, and why he was put here on earth — whether there is a real PURPOSE for human life, or what that purpose is. Man has not been able to discover the true way to peace, happiness, abundant well-being and real success. The colleges and universities of this world do teach students how to earn a living — but they fail to teach them how to live. The Bible is God's "instruction manual" to show His supreme creation how to live! Only in the Bible can one find this basic necessary knowledge. God inspired the Bible to be the very BASIS of true education. The Bible, then, is the FOUNDATION OF KNOWLEDGE! It gives the true approach to the acquisition of knowledge in the fields of history, education, psychology, sociology and the health sciences. It reveals basic principles concerning business, commerce, science, the arts, law, government, philosophy and religion. The Bible also explains the meaning of the chaotic times in which we live. And it shows us HOW peace, prosperity, success and happiness are coming to all the world in our lifetime! The self-proclaimed "experts" judgments are wrong. The Bible is true! And people could understand the Bible - if they were really willing to study it and accept it for what it says! The Bible is plain and simple. It means exactly what it says. If we take it as it is — without trying to interpret its meaning — it makes real sense. For more than a decade and a half, Ambassador College has been helping scores of thousands to become "Biblical literates" through the Ambassador College Correspondence Course. This unique course of Biblical understanding has led nearly 200,000 students in nearly every country on earth to a greater knowledge and understanding of the least-read and most-misunderstood book in the world. This course is a totally different method of Bible study. It makes it easy to understand the Bible, and shows how the Bible is RELEVANT to the Space Age! It is dynamic, down-to-earth — a course of understanding. It pulls no punches. It tells the truth straight from the Bible. You've never seen any course like it before. The Ambassador College Correspondence Course has been designed to guide you through a systematic study of your own Bible — the Bible is the only textbook. It is not a study of men's ideas about the Bible, but a study of the Bible itself. 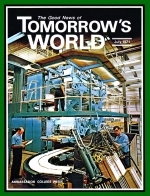 Many of the informative articles you read in TOMORROW'S WORLD magazine can only deal briefly with certain aspects of various subjects because of limited space. But each 16-page, beautifully illustrated, monthly lesson of this 24- lesson course provides ample space to present a very complete, in-depth study of each topic. Twenty-four different major subjects of vital interest in this fantastic pushbutton age are thoroughly gone into in the Bible and made clear with each lesson. You are directed step by step to the plain, simple answers in your own Bible! This course helps you find the answers to the really BIG QUESTIONS of life you have always wondered about. It is designed to show the meaning behind today's world chaos, and it helps you to see the very PURPOSE for your existence — the reason why you are drawing breath and experiencing life. Students from all walks of life are enrolled in this course — including even ministers of religion — and all are enthusiastically discovering new truth in their Bibles with the guidance of each lesson. They are all learning that there is HOPE for the future — that there are solutions to the absolutely terrifying and seemingly insoluble problems of today. They are learning the keys to understanding Bible prophecy, and the principles which lead to success, financial security and a happy, abundant life. But perhaps YOU are one of those who thinks, "A college correspondence course is too difficult for me. I'd never understand it." Or, "I'm too old." If you have ever thought that way, you couldn't be more WRONG! This course is designed for people of all ages — for YOU! And it makes studying the Bible enjoyable, rewarding — the experience of a lifetime. Thousands of our Correspondence Course students have written to the Editor expressing their sincere appreciation for the lessons. We'd like to share some of those letters with you, showing how our students are actually UNDERSTANDING the Bible for the first time, and finding that it is relevant to their own lives here and now! I would like to thank you for sending lessons from your Correspondence Course. My educational background was highly technical in nature: and I have, at times, overemphasized a logical approach to my study of virtually any subject. I had always been taught that the Bible could not be studied in a logical manner; however, your course has convinced me that such a method can be used in Bible study. I have been so well pleased with the Ambassador College Correspondence Course, I must let it be known. It was far beyond my imagination that such a course existed at all. In fact, before I started studying this course by mail I was under the impression that no one could learn the Bible by mail. 1 was wrong. I really am well pleased with the knowledge I've gained. I just completed the first lesson of the Ambassador College Correspondence Course. There aren't enough words to express my gratitude. I think the only word that can describe my feeling is relief! At last a source with which to really study and learn from the Bible, instead of just taking someone else's interpretation. All my life I've heard people say: "The Bible can be interpreted many ways." I can't say that I believed or disbelieved that statement. I just didn't think about it. To me it was just an impressive book that everyone seemed to have. Now that I have respect for the Bible and am reading it, I feel that no [human] interpretation is needed. It is plainly written. I am really looking forward to my next lesson. I have just received Lesson 1 of the Correspondence Course. I am delighted, overwhelmed! This is the most interesting and enlightening course of study I have ever undertaken. I can hardly wait for Lesson 2; and if Lesson 1 is any indication of what is to come, then please know that I will be corresponding for a long time to come. Before hearing The World Tomorrow broadcast I had many unanswered questions that were so big that a psychiatrist was unwilling to answer them for $20.00 a visit. The only answer 1 received from him was that I should take a trip to Europe, go hunting, roam the countryside to get close to nature, take up sail boating, get married, etc. This didn't answer any one of my questions. Through The World Tomorrow broadcasts and the Ambassador College Correspondence Course I have received direct and workable answers to all my questions. I am now learning the real purpose in life and receiving blessings beyond my wildest dreams. Please tell people they don't have to have a high education to take the Ambassador College Correspondence Course. I didn't finish high school and that kept me from writing for it for a long time. Now there isn't enough money to buy the lessons from me that I have received. You, too, can begin to share these same experiences. You can begin to UNDERSTAND the knowledge that really counts! The only qualification necessary for taking this course is the ability to read. No prior college training or other advanced education is necessary, as you have seen. These lessons are plainly and interestingly written so even a child can understand. And remember, there is no tuition cost to you! Your lessons have already been paid for by others who are voluntarily helping to send the Truth of God to all who request it. The Correspondence Course is absolutely free.